"Forty years ago, I began two years of service as a Peace Corps volunteer in Latin America. That experience left me with a great appreciation of the opportunities and advantages that I was given as a member of what was then a vibrant and growing American middle class. I have watched with increasing dismay the accelerating erosion of the American middle class. Indeed, I began to think that there was much about America of the late 20th century and the early 21st century that reminded of the highly class-stratified Latin America countries I saw as a Peace Corps volunteer. It is again time for broad debate on a fundamental question: Why should the workers whose productivity makes greater wealth possible not share in the benefits of that wealth? 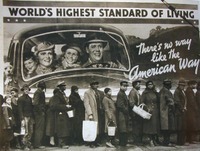 How can America be America without a strong and stable middle class?" Read more. Sometimes I feel as if I haven't been able to draw a deep breath since the day my husband, our chief breadwinner, came home eight months ago and told me he'd lost his job. "No one's fault, no reflection on your work," he was told. Reorganizations, cost-cutting, downsizing-that kind of thing. We Americans will adapt-it's one of the things we do best. New jobs will be created and the economy will eventually recover. However, it won't happen tomorrow. But here's another thing I learned from the Africans: how to be patient and weather the storm of challenging times with dignity and grace. How to accept things the way they are, difficulties and all. When I remember this, I look around at what my family does have now: adequate savings to squeak by, a beautiful home and lots of quality time together. My husband and I have the opportunity to sit in the backyard every night and watch our son frolic around, as the sun sinks slowly into the trees. Like my days in Africa, I've ceased to expect or hunger for things that are no longer accessible. I'm simply enjoying the purity of the moment. I think of my African friends, still there, still struggling, but surely finding time to play music and celebrate life. If you ask me, they are the true Wise Men from the East. Read more. Thomas Rooney writes: When President Kennedy met Prime Minister Nehru, he told him about the educational benefits the Peace Corps would have in India. Nehru replied; "Yes, I'm sure your young people will learn a lot." Those young people are now running the country. And it is time we started learning. It is ironic that 25 years ago, the Indians put themselves on this course by discarding socialism, lowering taxes, and encouraging trade. They learned it from us, too. Now we must relearn it from them. And we have a lot to learn, considering that Republicans in Congress can barely get a majority of their own caucus to support free-trade agreements. Not competing is not an option for our company--or for our country. In our case, we may be laying off nine employees, but we are hiring at least 30 more. In India, we are not just transferring work, but finding new customers. We spent time talking to the water authorities there about cleaning up the holiest and dirtiest river in the world, the Ganges. And we held similar talks with customers and suppliers in Hong Kong, Japan, Malaysia, and other parts of Asia. As these countries grow, so does their demand for goods and services that we in America can provide better than anyone in the world. But only if we are willing to recognize what our value is, and, above all, if we are willing to be fiercely competitive to provide them. No one can make any guarantees to any American company, at home or abroad, other than this: If we do not compete and make our products and services better, faster, and less expensive, we can and will lose. Read more. John Uniack Davis, graduate with a political science degree, discussed the most complex of Africa's health and economic challenges after a unique welcome from political science professor, Charles Weed, who shared letters received by his former student 22 years prior, during the first of Davis's experiences in the Peace Corps in Africa. Davis spoke about Africa's extreme poverty and how it is responsible for Africa's challenges with education, social justice, international equality and most importantly, adequate healthcare. "At least 50 percent of Africans live on less than one dollar a day," he said. "That's one third lower than the world's next poorest country, South Asia." Davis explained the complexity of Africa's cyclical debt crisis and the role of The World Bank and International Monetary Fund (IMF) in its continued economic devastation. Since its impoverishment had made it impossible to borrow elsewhere, Africa had nowhere else to turn to for financial assistance. Davis said for the past two decades World Bank and IMF have kept Africa reliant, bound with irreversible debts, and ultimately helpless in the fight against diseases and poverty. "Africa has found itself on the losing side of globalization," said Davis. Read more. Read more about the Peace Corps and Globalization.